Includes lunch, tax and tip. Please join us for this very special Featured Garden! 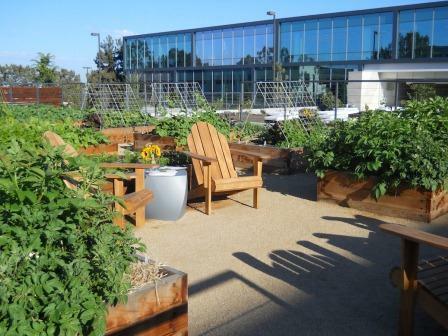 Corporate Gardens are the emerging trend at some of America’s major companies. Benefits include preventing employee burn out, increased productivity, team building, and access to fresh organic produce minutes from the cafeteria. 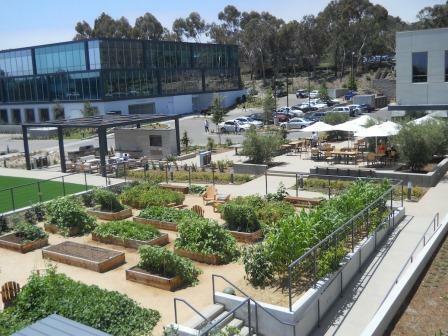 Nautilus Business Park, located just off Torrey Pines Road, has reconfigured the existing buildings and parking to create a drought tolerant garden and an organic vegetable garden. The onsite Green Acre Eatery uses the garden-fresh produce in meals for the business park tenants. We'll learn more about this new and sustainable concept for businesses and be treated to a tour of the garden followed by an organic vegetarian lunch. Urban Plantations, founded by SDHS member Karen Contreras, tends the quarter-acre garden three times a week. They weed, water and pick the veggies and fruit in a “seeding to harvest” cycle. Joel Cammett, Chef de Cuisine, will serve a special healthy organic vegetarian lunch created just for us at the Green Acre Eatery. They pride themselves on freshness, providing customers with healthy, delicious and organic food, complete with greens grown and selected from the courtyard garden. The restaurant is normally closed on Saturdays, they are opening just for us! Event will happen rain or shine...but don't worry, we can eat inside if there is rain. You must register and pre-pay for lunch to reserve your space.